Rubber is a popular choice for many commercial roofs – it has decades of proven performance as a long-lasting, versatile, durable roof system. However, just like any roofing material, it will eventually develop issues as time and exposure to the elements ages it. When your rubber roof needs repair, call Michigan’s full-service commercial roof repair contractor, Empire Contractors. Empire Contractors has the skilled labor and industry tools to repair any and all rubber roof damages. If you live in Muskegon or any of the neighboring communities – Shelby, Grand Rapids, Holland, Kalamazoo, etc. – give us a call today at (231) 861-7221. We are here to assist you! EPDM, or rubber, roofs have been on the market for well over 60 years. Property managers and business owners in our cooler climate appreciate its dark color, which can absorb heat to help warm the building. Its highly durable rubber membrane can be sealed with adhesive or seam tape to provide excellent protection and durability in any weather. Punctures – Rubber is susceptible to punctures, rips, tears, and holes from excessive, careless foot traffic or dropped nails and screws. 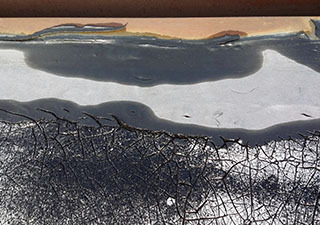 Shrinkage – Extremely cold temperatures can cause the rubber membrane to shrink, leading to gaps through which water can enter. 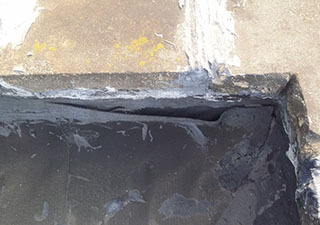 Deterioration – Over time, ultraviolet light can cause the roofing membrane to deteriorate, allowing water to enter. Standing Water – Low-sloped or flat rubber roofs commonly develop low spots, where ponding water can slowly degrade the roofing membrane, causing a leak. If you suspect you may have any of the above issues, or notice a decrease in the efficiency of your rubber roof, call Empire Contractors to talk to one of our experienced roofers about your repair options. We Make All Types Of Rubber Roof Repairs! No matter the size or difficulty of the job, we at Empire Contractors are equipped to take care of it. Our commitment to quality and customer satisfaction in the last 20 years has earned us a reputation as the best commercial roofer in the state. Superior customer education – Learn about your options without high-pressure sales tactics. Ongoing communication – Throughout your roofing repair project, we maintain open lines of communication. Skilled labor – The crew Empire Contractors is professional, experience, and certified. Commitment to honesty – We believe in practicing implicit integrity in all that we do, from project bids to installation techniques.